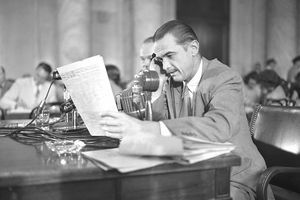 Examining the fascinating life of Howard Hughes. Howard Hughes was once the most talked-about entrepreneur in the world. He was legendary for his bold business tactics, his aviation accomplishments, and his outlandish personal life. The popular movie The Aviator has prompted a new interest in this fascinating entrepreneur. Born to a wealthy family in Humble, Texas 1905, Howard was not one who enjoyed attending private school in Boston. At the age of seventeen he dropped out, but thanks to a donation by his father to Cal Tech, Howard was able to sit in on college classes. Later on, Howard moved back to Texas and attended Rice University. Shortly after his eighteenth birthday, Howard's father died, and Howard dropped out of Rice after inheriting most of the family estate, including Hughes Tool Company. Hughes wasn't merely an eccentric billionaire, but a genuinely accomplished aviator. He won the 1934 All-American Air Meet in Miami with a speed record of 352 mph in the experimental military plane the "H-1". Hughes also piloted around the world in 1938 with a small crew, and broke Lindbergh's New York to Paris record in half with a time of 3 days, 19 hours, and 17 minutes. In 1932 Hughes formed Hughes Aircraft, which produced several inventions in aerospace technology. Howard was presented the Congressional Gold Medal in 1939 for his achievements in advancing science in aviation. One of his greatest inventions was the H-4 Hercules, a military air-boat plane. Unfortunately, the plane flew only once for a mile just over the water's surface but never got fully airborne. Howard was widely ridiculed, and the plane was nicknamed "The Spruce Goose." After the death of his father, Howard spent much time with his uncle Rupert, a writer for Samuel Goldwyn's Studios, which led him to a second career as a director, writer, and movie producer. His first film, Hell's Angels, combined his love for film and flying. Though the movie was a huge hit, the production of its towering flight scenes lost Howard $1.5 million (and several pilots). He later went on to produce the controversial Scarface (1932) and The Outlaw (1943). Hughes' wealth and power caught the attention of TWA president Jack Frye, who had been struggling to acquire new planes to stay competitive. Frye's influence led Hughes to purchase majority ownership, triggering a major turnaround for the company. Hughes himself directed ventures with Lockheed, including one of the most revolutionary planes, the Constellation (aka "Connie") for TWA. The plane was well liked for its attractive appearance and record speeds and helped TWA become competitive again. Howard Hughes was very hands-on in every film and every aviation innovation. Hughes flew all the planes that he helped design including the XF-11, an experimental spy plane for the US Army. The aircraft almost caused Hughes his life when it crashed landed in a Beverly Hills neighborhood, ripping through three houses and then exploded into flames. Hughes also piloted a plane in Hell's Angels. His compulsive and controlling behavior is part of what made him a strong and powerful businessman. Howard was popularly known as "The World's Greatest Womanizer." He married young to Ella Ice in 1925, divorcing in 1929. He was often with Katherine Hepburn in the 1930s. Other women that Howard dated were actresses Jean Harlow (whose breakthrough performance was in Hell's Angels), Bette Davis, Ava Gardner, and Terry Moore. Howard was also known to take aspiring young actresses and seduce them for one-night stands and brief affairs. As a young boy, Howard's mother was completely obsessed with his health. Following an illness that temporarily paralyzed him, he developed a severe fear of germs. Howard likely suffered from Obsessive-Compulsive Disorder, Bipolar Disorder, and paranoid schizophrenia due to brain damage from plane crashes. His illness grew increasingly over the years, and Hughes hid from the world. When he died in 1976, his appearance was so radically changed they had to take prints to identify his body. Hughes left an estate of approximately $2 billion, and no proper will. Over four hundred prospective heirs tried to inherit his money, but in the end, it was spread out amongst 22 cousins in 1983, seven years after his death. Later, Terry Moore claimed that the two had secretly wed and never divorced. She was paid in settlement. The U.S. Supreme Court ruled that Hughes Aircraft was owned by the Howard Hughes Medical Institute, who sold it to General Motors in 1985 for $5 billion.